Fall shows at the American University Museum at the Katzen Arts Center will open Sept. 5. Opening Reception: Saturday, Sept. 9 from 6-9 p.m. Focusing in on Arab art, AU Museum will host two international traveling exhibits featuring a range of Middle Eastern artists. The first exhibit, BETWEEN TWO ROUNDS OF FIRE, THE EXILE OF THE SEA: ARAB MODERN AND CONTEMPORARY WORKS FROM THE BARJEEL ART FOUNDATION, is curated by Karim Sultan, director of Barjeel Art Foundation, and runs through Dec. 17. The exhibit showcases a diverse selection of works, grouped around the theme of technologies in conflict. 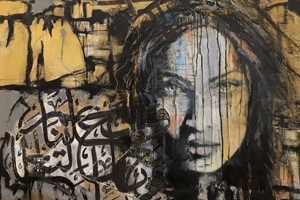 The works come from the collection of the Barjeel Art Foundation, an independent United Arab Emirates-based initiative established to manage, preserve and exhibit Arab art. Both modern and contemporary artists from the Barjeel Collection are featured, including Mona Hatoum, Walid Raad, Etel Adnan, Shakir Hassan Al Said, Hayv Kahraman, and Asim Abu Shakra. Gallery Talk: Sept. 9 from 5-6 p.m. Started in 1957 by four American University art professors and Washington art expert Alice Denney, The Jefferson Place Gallery was an early supporter of the Washington Color School and host to exhibitions featuring prominent art figures including Jack Tworkov, Robert Goodnough, Toko Shinoda, Robert Rauschenberg, and Jasper Johns. MAKING A SCENE: JEFFERSON PLACE will exhibit work in various media, including painting, sculpture, works on paper, and ephemera. It will include works by the founding 11 gallery members: George Bayliss, Lothar Brabanski, William Calfee, Robert Gates, Colin Greenly, Leonard Maurer, Helene McKinsey Herzbrun, Ken Noland, Mary Orwen, Shelby Shackelford, and Joe Summerford, as well as artists whose works have been shown in Jefferson Place Gallery shows. This September marks the gallery’s 60th anniversary. Through Oct. 22. Alper Salon/gallery talk: Thursday, Oct. 12, 5:30-7 p.m. In TWIST - LAYER - POUR, the unexpected grouping of Sondra N. Arkin, Joan Belmar and Mary Early yields a dynamic, site-responsive meditation on systemized components and accumulated wholes. Step by step, link by link, their obsessive object making becomes a metaphor for conscious and intuitive gesture, relational interconnectivity, and the passage of time. At once public and private, monumental and intimate, the works profess an unswerving passion for their chosen materials: steel wire, synthetic papers, and beeswax. Individual variances and details invite close attention while in the aggregate, distilled shapes and rhythmic patterns emerge. Curated by Sarah Tanguy and showing through Oct. 22. Gallery talk: Sept. 28, 6-7:30 p.m.
Born in Albuquerque, New Mexico, and raised in Boston, Christopher Carter infuses a blend of ethnic and urban influences into all of his work. His bold and decisively organic sculptures strongly reflect his African-American, Native American, and European heritage. Rarely using anything “new,” Carter fashions a chorus of images composed of recycled woods, metals, glass shards, rope, resins, and a variety of discarded objects, that when brought together seek to depict traditional concepts in an innovative and creative way. In TETHERED TO THE CRADLE: KINETIC WORK BY CHRISTOPHER CARTER, the interactive, ready-made forms draw on Carter's experiences and memories of his adolescence for their inspiration. For the past two decades, AU alum William Woodward has delved into the rich history and aesthetic possibilities of the seven deadly sins. In WILLIAM WOODWARD: THE SEVEN DEADLY SINS, the drawings and narrative paintings owe a great deal to the films of Federico Fellini, Charlie Chaplin, Buster Keaton and the commedia dell'arte tradition. The artist tries to imagine, had these directors and actors been painters, how they might have depicted their subjects. On display through Dec. 17. Gallery talk: November 16, 6-7:30 p.m.